A portion of the links and recommendations below are affiliate links. This means that at no additional cost to you, I will earn a commission if you choose to make a purchase. I have personally read each of these books or used these tools and would not recommend them if I did not appreciate the quality of the resource that I received. These two texts will end up being your "go-to" when you have questions about how you should teach a topic, why students might be having trouble, or if you are questioning the way your curriculum approaches the skill. There is a primary Pre-K-2 version and also a text for grades 3-5. If you are a math interventionist working across the building, you want both! I did a book study on the primary text if you would like to see a bit of what you will find inside. If you are a primary math teacher, Prek - 2, this book is for you. 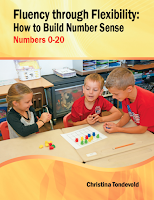 "Number Sense" is such a broad topic and it can be overwhelming to figure out how to build number sense in your students. This book breaks number sense into 4 pillars. The front of the book describes the research around number sense and these four pillars. The remaining four parts of the book describe activities you can do in your classroom in minimal time and with minimal materials to boost those four pillars and develop number sense in your students.